This could have been the view over the O’Connell Bridge…. | Come Here To Me! This could have been the view over the O’Connell Bridge…. Recently I read a fascinating discussion on Twitter where people were debating some of the more controversial (shall we say) buildings in the city of Dublin. 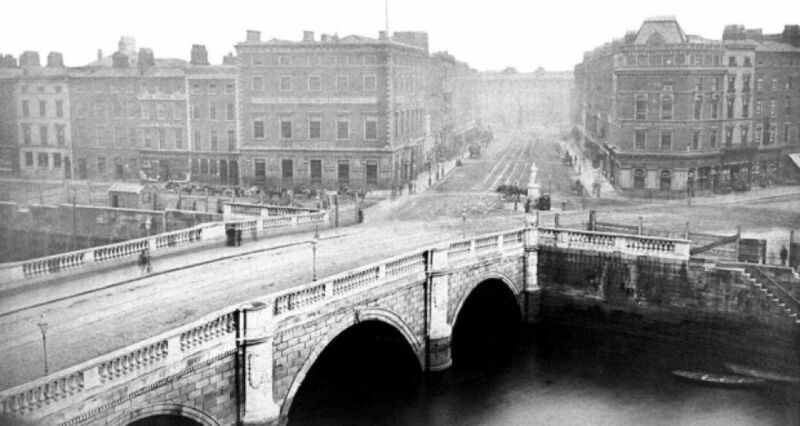 Hawkins House and the Central Bank naturally made an appearance in the discussion, but there was also reference to the O’Connell Bridge House beside (obviously enough) the O’Connell Bridge. I was unaware that the architect behind the project, Desmond Fitzgerald, had sketched two buildings in his original proposal for the site, and the Irish Architectural Archive posted a quick snap of his drawings. Architect Ciarán Ferrie put the image above together quickly to give us an idea just what it may have appeared like had Fitzgerald’s plans come to fruition. 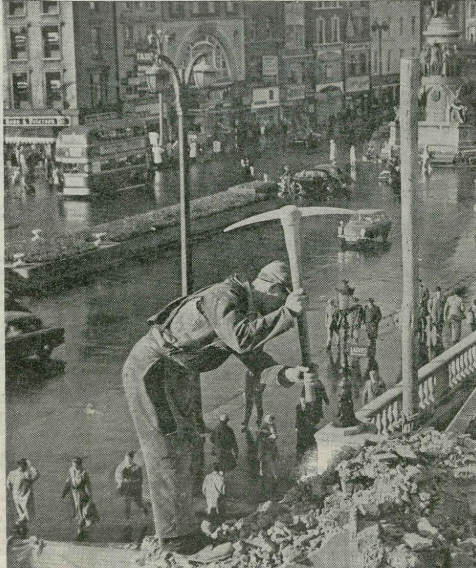 …consumed 500 tons of structural steel, 90 tons of steel-reinforcing bars and no less than 7,500 tons of concrete – not to mention the Portland stone cladding. It cost £1 million, kept more than fifty men at work for two whole years an, in the end, stood at 145 feet tall – eleven feet higher than Nelson Pillar. So much for that handyman, his son and ladder. McDonald believed that “the most incredible fact about O’Connell Bridge house is that it was built at all.” The building contained 45,000 square feet of office space, but not a single car parking spot, despite the fact Dublin Corporation were adamant at the time that there be a carparking space for every 500 square feet of office space. 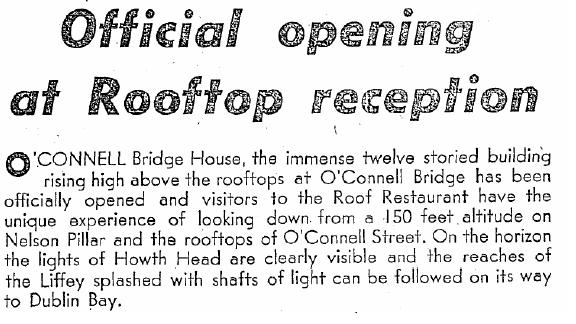 When O’Connell Bridge House opened to the public in the 1960s, contemporary newspaper reports noted that the office block included a rooftop restaurant offering views over the city. Evidently it was envisioned that the building would fulfill many roles, serving not merely as another office complex in the heart of the city. It is probably best known to Dubliners not for its ill-fated restaurant however but the hugely expensive advertising signage upon it. Having previously promoted both Guinness and Coca Cola, in recent years it has become synonymous with the Heineken advertising upon it. Not too long ago I heard two Dublin young lads standing at the traffic lights beside the building refer to it as “the Heineken building”, proof that advertising works. 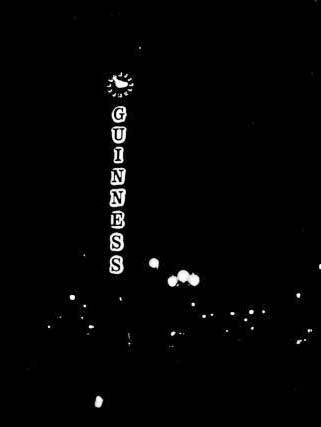 Guinness ad on O’Connell Bridge House the night the army blew up the remains of Nelson’s Pillar. The nuclear bunker at Wood Quay has got to go first. There is not one decent bit of architecture in the whole of Dublin. A shabby city. Did you know that Desmond FitzGerald had a brother called Garret? Yes, and a son called Deasmhumhain. Hello this is Guy and does anybody know about who was the painting artists in and round about 1890, from sackville street dublin, there are no names on the pasteboard, just numbers. circa around 1890, excellent cond, this is a original watercolour painting. It also has the great Pillar and also Gratten in the painting. I worked there through the winter of 85/86. Christmas party in the North Star on Amiens St. There was a glorious neon Bailey’s sign across the river where the dreary Nokia one is now. When that would come on mid afternoon it was time for us young uns to get out break up in the ‘restaurant”. Hot water from a boiler for black tea cos no one would go down 12 floors for milk. Taking home 55 quid a week on some government trainee scheme. 30 kids just out of school taking phone calls from all round the country about a new grant scheme that was rolled out the previous week: we spent an unpaid Saturday in the Custom House being brought up to speed on all of that and on the Monday were given a phone and told meet the public. Is it my imagination, or does the building in the centre of the first photograph, the one I remember from the early 1960s, look nothing like the one in the picture lower down, entitled “A view of the Carlisle Bridge House as it appeared”? I assume they were two different buildings. As an aside, and I’m open to correction, I believe this site to have been the location of the premises of the tobacconist Lundy Foot, famous for originating High Toast snuff, after he moved from 6 and 7 Essex Bridge, Dublin. To address another point, Dublin has some absolutely glorious architecture. Unfortunately, none of it is of recent date.